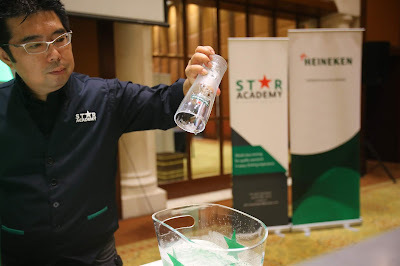 Today, HEINEKEN Malaysia’s Star Academy kickstarted its flagship programme - Heineken® Star Serve – where frontline staff are trained to pour the perfect pint based on the five-step Heineken® Pouring Ritual. This year, the Star Academy will be training over 600 participants across eight cities in July. The best bartender will be selected to represent Malaysia at the Heineken® Global Bartender Finals in Amsterdam, the Netherlands. Step 1 - Rinse the glass to make it clean and cold. Step 2 - Pour with the glass at a 45° angle for a full, satisfying head. Step 3 - Skim off the foam at a 45° angle to seal the head. Step 4 - Check that the head sits on the horizontal line of the star. Step 5 - Serve on a coaster with the logo facing your customer. * HEINEKEN Malaysia’s Star Academy provides professional training solutions to business partners and frontline staff by equipping them with skills in the areas of product history and knowledge, technical know-how, as well as responsible serving and retailing. 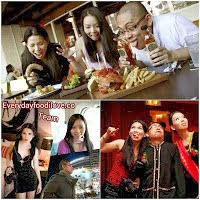 * Besides training, competitive selections are also held to identify the best bartenders in the country. From participating outlets nationwide, top performers will then be chosen for the national finals after rigorous theoretical and practical assessments. 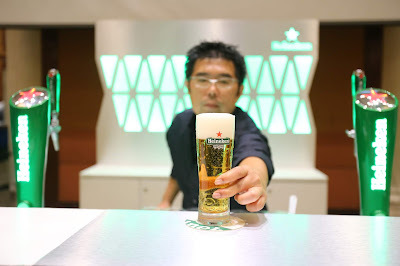 * Through Star Academy’s flagship programme – Heineken® Star Serve – frontline staff are trained to pour the perfect pint based on the five-step Heineken® Pouring Ritual. The best bartender will then be selected to represent Malaysia at the Heineken® Global Bartender Finals in Amsterdam, the Netherlands. * Malaysian finalists have made the country proud on various occasions – Eddy Jay Jaimin was crowned the champion in the 2016 Heineken® Global Bartender Finals, while Jimmy Goh Teong Hock was the runner-up in 2013. * This year, the Star Academy will be training over 600 participants across eight cities in July. * With the Drink Sensibly programme in its eighth year, HEINEKEN Malaysia is committed in building a culture of responsible drinking by educating consumers on practical tips and information, and encouraging moderation as key to life and enjoyment. * Drink Sensibly has reached out to more than 14.8 million consumers, engaged more than 550,000 consumers, partnered with 60 outlets to educate consumers on responsible drinking, and has offered 3,200 discounted rides to revellers from 2014-2017. * In 2017, we carried out a four-week ‘Get Ready to Party’ campaign that we rolled out nearing Christmas and New Year reminding revellers to drink sensibly. * HEINEKEN Malaysia actively advocates responsible consumption across all its products and events, including Heineken® Star Serve where participants are educated on the important aspect of responsible serving. HEINEKEN Malaysia also produces the wholesome, premium quality non-alcoholic Malta. HEINEKEN Malaysia’s brand portfolio also includes the No. 1 German wheat beer Paulaner, Japan’s No. 1 100% malt beer Kirin Ichiban and the World’s No. 1 ready-to-drink alcoholic beverage Smirnoff Ice. The Company continues to lead the responsible drinking agenda through its Drink Sensibly campaign. Jonathan Chong's foray into this industry started in 2012 by managing all aspects of the training programme. 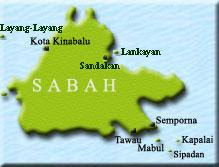 Back then, the programme was called GAB Academy. The mechanics of the programme has evolved throughout the years resulting in HEINEKEN Malaysia’s Star Academy today. However, the objective and material remains as the core foundation of the programme. Equipped with the wealth of experience, Chong took up the trainer role in 2016. His contribution has led to the growth and scale of the programme that it is today. His vision is for every HEINEKEN customer to be served the perfect serve, every time. 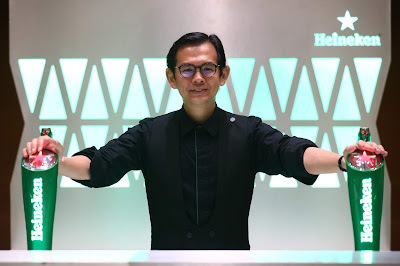 He hopes to achieve this by elevating the expertise of Malaysian bartenders and front liners while inspiring them to take pride in every perfect serve. Thomas Ling is a Certified Beer Server and Certified Draught Master with HEINEKEN Malaysia, bringing with him a wealth of experience from his 18 years in the industry. Aside from being Malaysia’s first Certified Sommelier (certified by the Court of Master Sommeliers, UK), he has a long list of accreditations to his name, such as an International Burgundy & Bordeaux Educator with the BIVB & CIVB France; a Certified Specialist of Wine and Spirits with the Society of Wine Educators, USA; Master of Sake (Kikisake-shi); Certified Sake Educator & Specialist and Certified Whisky Ambassador in the UK. A regular invited speaker for industry trade seminars and an experienced panel judge in international wine and spirits competitions, Ling juggles his time as the principal partner at Entwine, a consultancy offering niche business solutions for the F&B industry in the ASEAN region. He also consults for key wines and spirits importers, leading hotel resort group establishments and gourmet retail chains within the country on their wine portfolio selection and beverage training programmes.